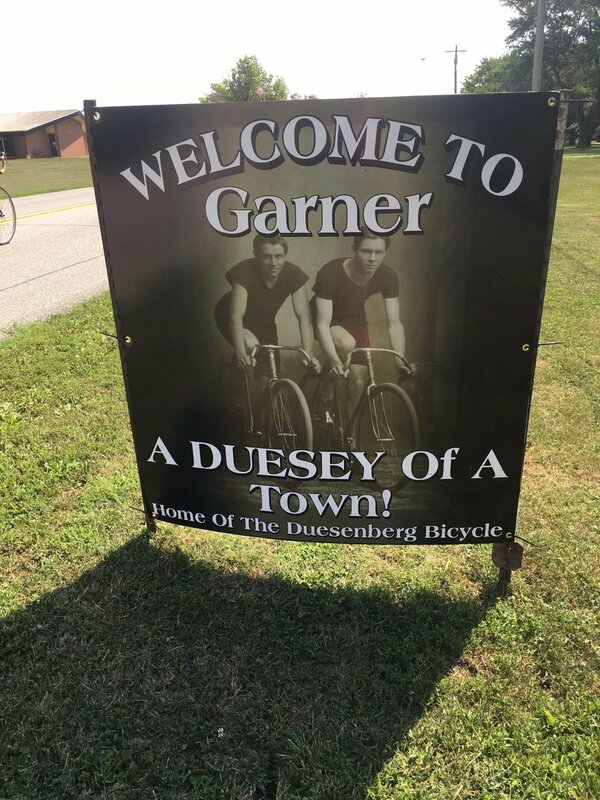 Riders are laughing at the sign and the “Duesey of a Town”, but I think they’re missing the explanation at the bottom. The girls seem to be doing okay. Becky said things were getting to her a bit yesterday and she was grouchy, but Toni said she was fine. Vice versa, apparently Toni was a little testy tonight when they got in and their bags had been sitting out and got wet. They rode through a lot of light rain today, which Becky said was mostly okay. Better than the wind yesterday. She said she had wind burn from yesterday. They had mostly headwinds and the report was that it was consistently around 17 miles an hour. There was a little excitement tonight. Someone slipped and fell in the shower. Feet went out from under her, fell backwards onto her back and hit her head. Had to be carried out. She said it was a little scary. Then they went for Pizza tonight and waited over an hour to get served. They weren’t happy. As if this isn’t difficult enough on my road bike! Enjoying Beer and Music in the Park in Garner, IA. A pleasant lunch spot! Looks like my dog, though I can’t imagine Murphy going for that! This have me a “dog fix” at least. I’m missing Murphy! 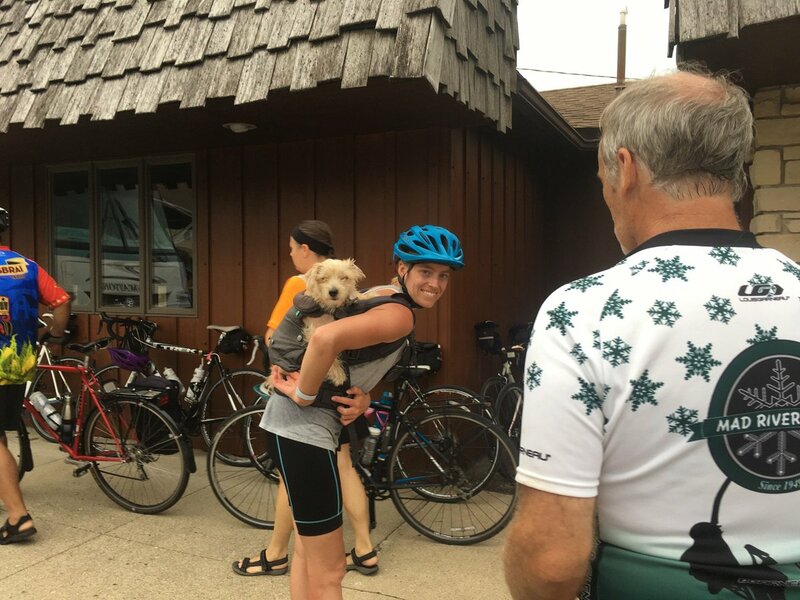 I’m taking over the writing here to update you on Becky’s RAGBRAI journey. I do this for friends and family, so thought it would be worth sharing with her clients following online. Becky and her sister-in-law, Toni, headed out for Iowa last Friday. Toni got to our house a little before 10, but they ran into complications with the new bike carrier and didn’t get on the road until after noon. Both of their bikes have small frames, so getting them on the standard size carrier was a challenge. Toasting their arrival and the start of this year’s adventure. 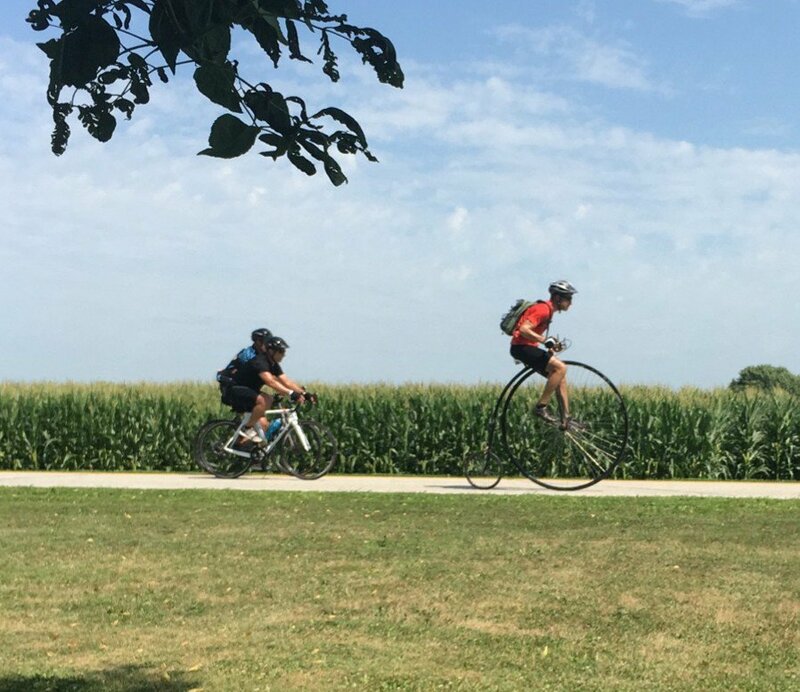 This RAGBRAI route is in the northern part of the State. It’s a little shorter at under 450 miles, but very hilly… or as Becky said, small mountains…. She had been worried about getting through Chicago, but said getting to Chicago was worse. Lots of road construction. Then at the end of the trip, Google took her on a lot of county roads. She said it was pretty going around cuts into the hillside, but it wasn’t a direct route. They had been concerned about rain forecasts in Iowa for Friday, but the rain had stopped when they got there. Unfortunately, the camp site was still wet and muddy. It wasn’t a huge campsite, but Becky was still concerned that there were only two Kybos for the whole site. Saturday morning there were some issues with their bags when they got to the charter bus. They are allowed 50 lb and they’re always pushing it to the limit. Because of the wet tents they were over, so they had to do some creative repacking. 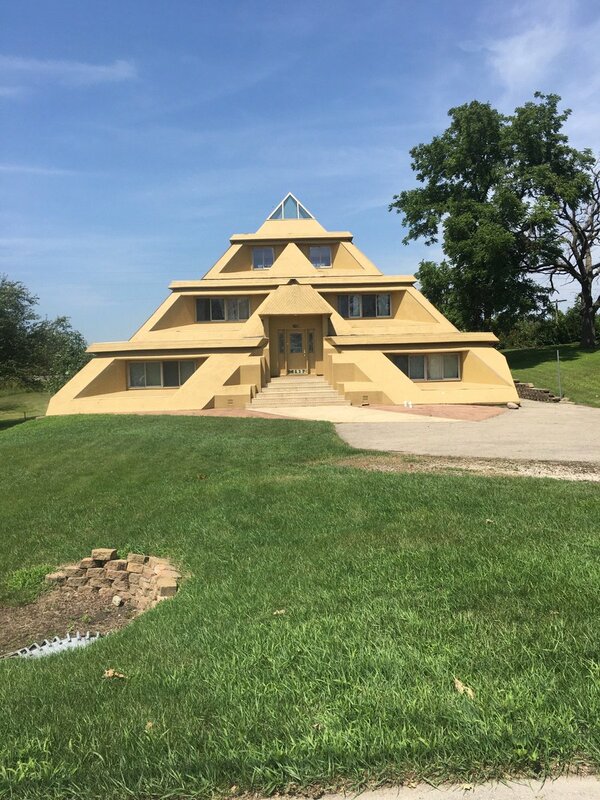 The trip to the West side of Iowa was uneventful, though most of the trip was through Minnesota… that’s how far north they were. Becky said everyone sounds like extras from Fargo with the accents and speech patterns. Saturday night’s campsite was a little better. They found a grassy spot to set up. Rich, the guy that traveled with them in the past, bailed this year. Apparently some health problems. Becky had bought some blow-up seats. They blow up by whipping them around to catch the wind and then they look like a big pea pod. Toni didn’t have room for hers, so they shared one. It got them off the ground, but she said it was tough not rolling against each other. Sunday was the first day of riding. It was about a 60 mile day. Unfortunately they missed the sign for the campsite and added about 7 miles to the day. Becky said it went pretty well, but she was really yawning when we talked at about 9:30 last night. She was bummed that the battery charger on her bike wasn’t working so she was having to find places to charge the phone. Becky found the craft beer tent along the way. They met up and found ice cream and walking tacos along the way too. Last night was Chinese noodles for supper. I’ve heard from her a couple of times today and she’s doing okay, though a little sore. She bought a new bicycle seat and hadn’t broken it in before leaving. Apparently it’s breaking HER in at this point. She’s better than 3/4’s of the way through today, so she’ll be fine. I think those are the highlights. I’ll also post some things to BergerAud15 on twitter if you want to follow that. 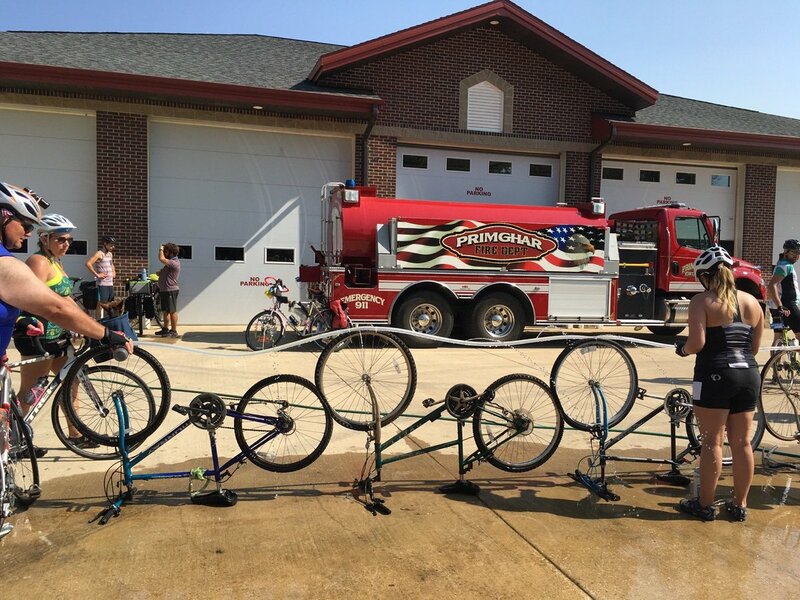 Those of you that know me, know I’m down to the wire in my preparations for RAGBRAI. 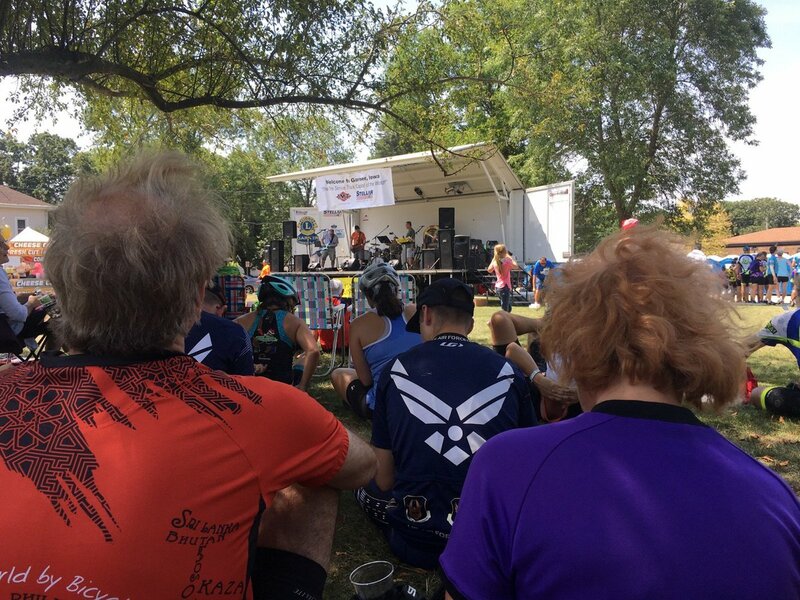 (And for those of you that want to know more about this year’s RAGBRAI, follow the link here.) I’m known to procrastinate in my training, but this year has been a little worse than usual. I’m not much for cold weather riding, so I didn’t get started as soon as I would have liked. Then I came down with a cold over Memorial Day weekend which turned into Pneumonia. It’s hard to ride a bike when you can’t breathe, so I lost almost four weeks to illness. I felt like I was back starting from scratch when I got back out after that. I’m back on the saddle now though and putting in a few more miles each weekend. This weekend I took advantage of the holiday and got in about 100 miles. 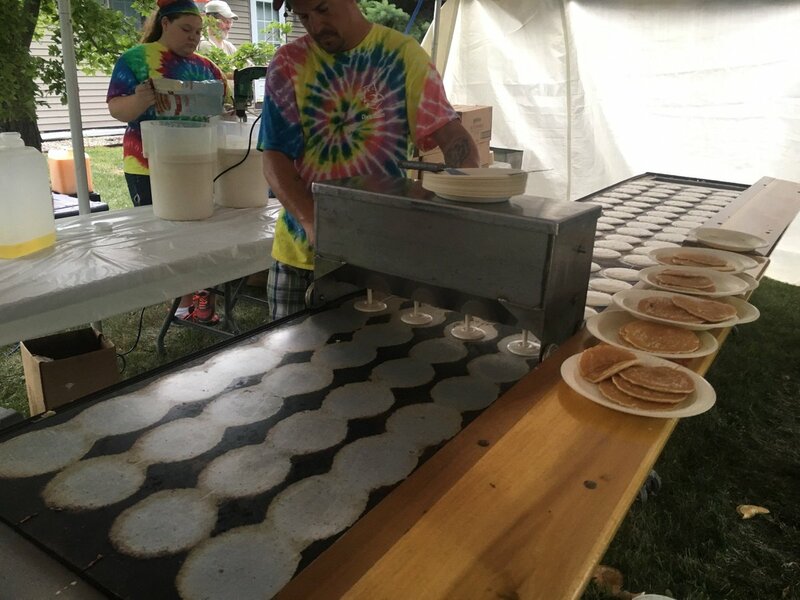 I rode around Ancilla College on Saturday, put in about 60 miles on the Nickle Plate Trail out of Rochester on Sunday and got another 25 miles in around Lake Maxinkuckee on the 4th. I’ve only got about three weeks to go though before I hit the road on the 21st for Lansing, Iowa. They usually recommend getting in about 600 miles of training before RAGBRAI, but I’m going to be hard pressed to get that total this year. If you’re interested in following me, I’ll have Kevin post some updates and pictures that week. Stop by and wish me luck before then! Plan your hearing aid breakdowns to be simple the week of July 24th. Sandy will be holding the fort down all on her own. We see the romanticized portraits of those who signed the Declaration of Independence and really don’t consider what they risked to bring us the liberties that we enjoy. They might well shudder with rage to see how easily we consider giving up those rights when it seems expedient to us. 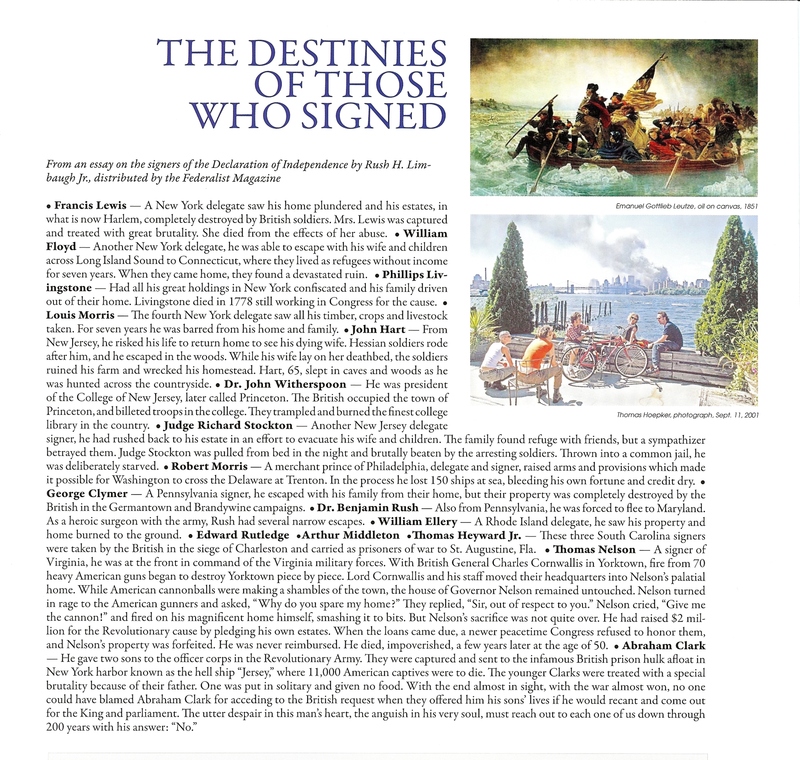 Take a look at the excerpt (upper right) which lists some of the lessor known patriots who were signatory to the Declaration of Independence and the not so pleasant fates they met after signing the document that marked the birth of our nation. Some lost their lives, some lost the lives of their families and some lost fortunes, all of which they pledged to the cause of Independence. As July 4th rolls around on the calendar, all Americans should be cognizant of the sacrifices of the past as well as the sacrifices of those currently serving in our military to protect the rights and liberties we enjoy. It did not end with declaring independence. No, our independence had to be forcibly taken and now, just as they did then, we need to cherish it and fight to maintain it. The except in the captioned box is taken from an essay on the signers of the Declaration of Independence by Rush H. Limbaugh Jr., distributed by the Federalist Magazine.